Due to the advancement in technology, you can find numerous travel routers that have multiple functions, thus, providing multiple benefits to their users. 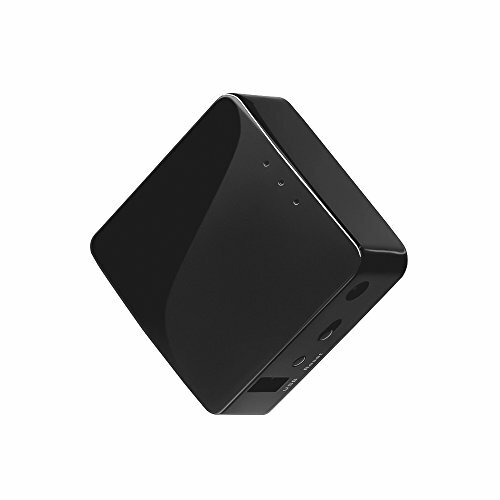 Among the travel routers, with such trait, is the GL.iNet GL-AR300M Mini Travel Router. It has a lot of features that allow users to do various things. Its sources of power are power banks, 5V DC adapters, and laptops. It is compact; it is designed to fit the pocket. It converts public Wi-Fi (in restaurants and cafes) into private Wi-Fi. It converts wired networks in different places, like offices and hotels, into the users’ own Wi-Fi. When users switch to a new Wi-Fi, it automatically connects devices without the need to input the password on each device one by one. It includes Open WRT and Open VPN. It can connect to and work well with a web cam. It can be easily programmed. It has a huge storage and is highly extensible. It is flexible enough to be powered by a power bank, laptop, and adapter. It provides ease to its users by being programmable and having a huge storage and high extensibility. It allows more users to enjoy internet connection in hotels and offices by converting wired networks into wireless networks. It provides security by converting public Wi-Fi into a private one. It helps users save time by automatically connecting all devices when switching to a new Wi-Fi, without requiring to input the password one by one. Its firmware is easy to update. It certainly fits travelers due to its light weight. It may require frequent resetting. It may not suit those who don’t have enough knowledge about network concepts. Indeed, GL.iNet GL-AR300M Mini Travel Router has a lot to offer its potential users. First is its flexibility. Users don’t have to worry if it runs out of battery for they have various battery sources to choose from. It likewise makes connecting to the internet easier and more secure, as it converts wired networks to wireless and public Wi-Fi to private. Moreover, it helps users save time by automatically connecting their devices when switching to a new Wi-Fi and not requiring them to input the password one by one. It likewise makes the users’ experience more enjoyable as it is web cam expandable. Its firmware is also easy to update. The product is very light, suitable for travelers. It is a quality product and works well. As for its downsides, it may require frequent resetting and may cause some challenges to people who are not that knowledgeable about network concepts. The positive traits of GL.iNet GL-AR300M Mini Travel Router are impressive and exceptional, making it worth a buyer’s money and trust. It is very clear that this product is more than a travel router. It has numerous functions and allows users to do various tasks as well. It provides convenience and offers high quality that they can truly enjoy. This product may have some disadvantages, but they are manageable and don’t outweigh the advantages. Just make sure to do enough research about this product and be certain about what you really want. There is no doubt that travel routers can be of great help to a lot of people especially those who are always on the go. However, these devices don’t come with the same features. They are designed to fit certain lifestyles and needs; therefore, you need to be certain about your requirements before purchasing one. But apart from that, one of the first things you should do is educate yourself about the basics. When you know how travel routers work, it becomes easier for you to pick the best item for you. While travel routers are generally battery powered, some can operate using an AC power. You can also find some that can be powered by laptops. Travel routers have the capacity to work like regular ones. They can allow multiple devices to share a connection. This is especially beneficial to those who travel in groups or a lone traveler who needs to have multiple devices connected simultaneously. As you know, public Wi-Fi can compromise your security. But if you opt to use a travel router, you are able to create a safe hotspot. You can convert a public Wi-Fi into a private one. If, for example, there is a single Ethernet connection in a certain area but there are multiple devices that need an internet connection, a travel router can easily provide the connection that you need. You can also rely on it if you have mobile devices with no Ethernet ports.